I LOVE peanut butter. LOVE, LOVE, LOVE. Because of my love for peanut butter I feel it necessary to clarify some of the flack that PB has taken in the past few years. 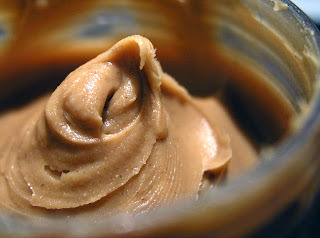 Most people think peanut butter and they immediately think; A) fattening B) stay away C)loaded with calories D)healthy? no, too good to be true. If you are a peanut butter lover, like myself. I urge to you read on. I think you'll be pleased. Let's clear some things up. A) Fattening? Yes, peanut butter does have fat in it. BUT before you drop the Skippy and run you have to realize there are different kinds of fat; Saturated, Monounsaturated, Polyunsaturated, and Transfat. Saturated and Transfats are the ones you should stay away from. You shouldn't have more than 10 grams of saturated fat in your diet in one day. These fats are solid at room temp, and are found mostly in animal products (think animal fat, butter, shortening, etc.) These fats raise blood cholesterol and will increase your risk of heart disease and stroke. Monounsaturated & Polyunsaturated fats are liquid at room temp, and are actually oils. They have just the opposite effect. They decrease blood cholesterol. This means they are actually good for you. Peanut butter is comprised mostly of mono and polyunsaturated fats. B) Stay away? No! you really don't have to. Knowing that peanut butter is full of good fats, and protien, you can start to see that it is actually good for you. Studies have shown that eating 1-3 servings of nuts per day can decrease your risk for heart disease. FYI: Heart diesease is the #1 killer in women today. However, PB is high in calories. Which leads me to C) Loaded with Calories? I would have to say yes to this one. PB is higher in calories, so i'd make sure you are eating it in moderation. BUT as long as you have room for it in your diet, it will be a benefit to you. NOT a detriment like many people believe. Remember, I'm not talking about Reeses Peanut Butter Cups. D) Not Healthy; too good to be true. I hope I've shown you that this isn't the case. Peanut Butter IS good for you, and SOOO tasty. I am not lying when I say I enjoy myself a PB and honey sandwhich on whole wheat bread quite often. Look for brands of PB that are natural, and they tend to be lower in sugar. Some health food stores even have stations where you can smash your own peanuts into fresh delicious PB. However you smash it, don't feel guilty! Remember, it's good for you. Now if that isn't finger lickin' good news I don't know what is! hahaha.. DARN RIGHT THAT IS FINGER LICKEN GOOD NEWS!! haha i love you and i love me some PB and H sandwiches! I stinken LOVE peanut butter (on a spoon, with honey or jelly, on celery), and actually when I did LA weightloss, I wasnt eating enough meat/protein, and they said EAT peanut butter, to make up for the protein. Boy did I ever eat some peanut butter and I still lost 65 lbs. So I know you can lose weight on it and eat it in moderation. Mmmmmm.....you know how I couldn't live w/o my pb&j!